Dr. Josh Storm was born and raised in New York. He received his Bachelor’s degree in Psychology from Tufts University in Massachusetts in 2003. During his senior year, he shifted his focus from studying human to veterinary medicine. After graduation, Dr. Storm lived in New York City for two years, working as a veterinary nurse and taking the prerequisite classes for veterinary school. 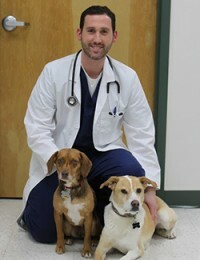 Dr. Storm graduated from the University of Florida’s College of Veterinary Medicine in Gainesville in 2009. While attending veterinary school, he received many awards and distinctions for his efforts during the course of study which included: the Florida Veterinary Medical Association’s Charlie E. Bild Clinical Proficiency Award, recognizing outstanding clinical skills with both small and large animals; the Frances Dunnigan Scholarship, awarded for outstanding performance in the studying of small animal internal medicine; and the J.E. Salsbury Veterinary Medical Scholarship for achieving educational and professional goals. After graduation, Dr. Storm was selected for and completed a rigorous one-year medical and surgical internship at Coral Springs Animal Hospital, a 24-hour critical care facility in Coral Springs, Florida. He then practiced progressive general medicine and emergency/critical care in Florida, North Carolina and DC before taking over ownership of Woodley Gardens Veterinary Care in September 2015. Dr. Storm has special interest in preventative care, internal medicine, surgery, emergency and critical care medicine and enriching the human animal bond. He also is certified in Veterinary Acupuncture and integrates this treatment to the excellent care provided to the patients at Woodley Gardens Veterinary Care. Dr. Storm serves on the Advisory Board for Veterinary Team Brief, a national publication that delivers practical skills for team-based medicine, and is a member of the American Veterinary Medical Association and the American Animal Hospital Association. Outside of work, Dr. Storm enjoys long distance/marathon running, leading a Tough Mudder Obstacle Course team, scuba diving, playing guitar, skiing/snowboarding, and rooting for the Gators. He has two great rescued mixed breed dogs, Tela and Tubs, who can frequently be found hanging out in the office.